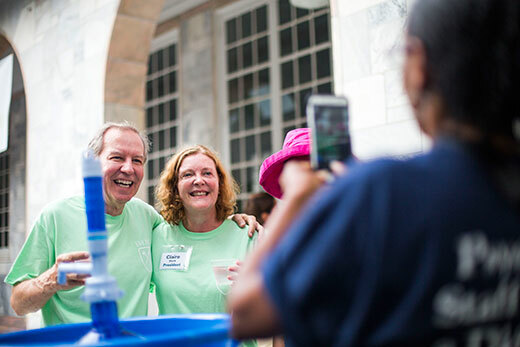 Emory students, faculty and staff are invited to a block party on Friday, Sept. 9, to welcome Claire E. Sterk as the 20th president of Emory University. At the event, set for 11:30 a.m. to 1 p.m. in Asbury Circle, attendees can visit with Sterk and her husband, Rollins School of Public Health research professor Kirk W. Elifson, while enjoying live music and free food from S&J Woodfired Pizza, King of Pops and Coca-Cola. Already a respected leader at Emory, Sterk officially assumes her new role on Sept. 1. She was chosen unanimously by the Emory University Board of Trustees after an intensive national and international search to select the successor to James Wagner, who retired after 13 years as Emory's president.